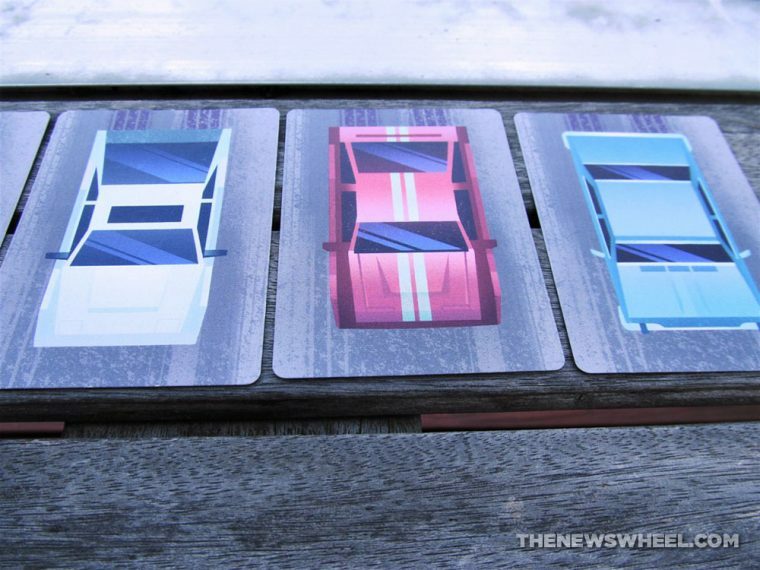 For as many automotive racing board and card games have been made over the years, very few of them involve the white-knuckled sport of drifting. Originating on the hairpin turns of snaking Japanese roads, the high-skill motorsport holds many possibilities as simulation game. While’s it’s been recreated many times as video games, it’s much more difficult to adapt as a non-real-time, tabletop gaming system. 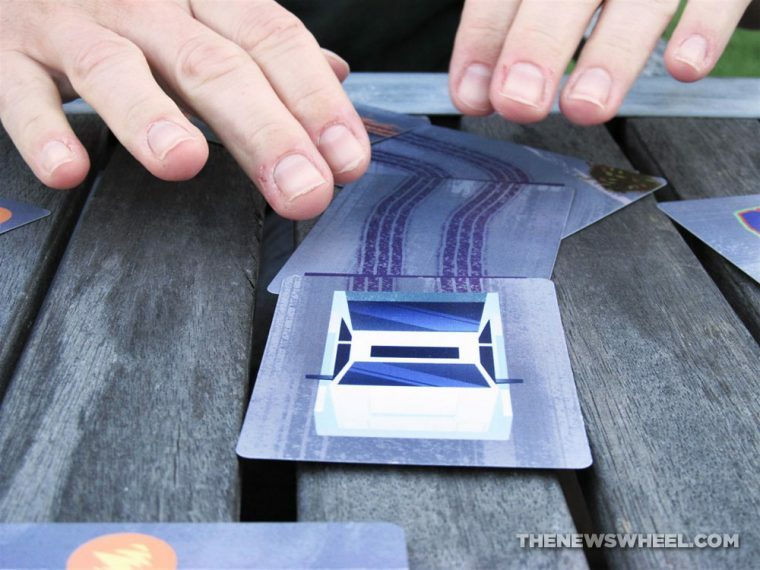 Instead of being limited by a track on a cardboard print, designer Rob Cramer had the idea of opening the driving field using the space between cards to serve as the track, with the cards merely directing movement and limitations. His new game, Turbo Drift, hearkens back to the origins of drift racing in a unique way. Love Street Racing? Check out the official Fast and the Furious board game! Like any good auto racing game, the goal is to cross the finish line first. But, the gamemaker doesn’t determine where the finish line or race track is; you do. Turbo Drift requires an empty 3ft x 3ft table (minimum) across which you’ll scatter a collection of obstacle cards. At one end of the playing field, you’ll align the row of players’ chosen cars; at the opposite end, you’ll place the finish line card. 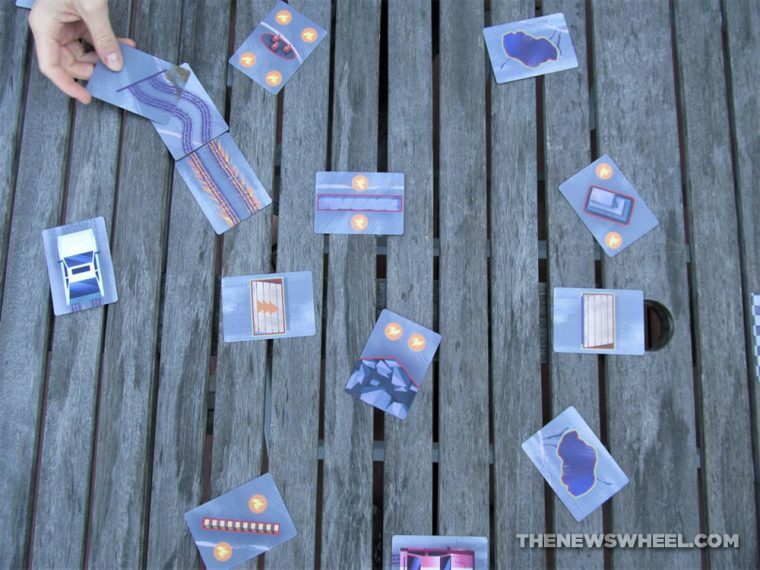 Six cards representing different angles of movement are placed face-up in a grid on the side of the table. 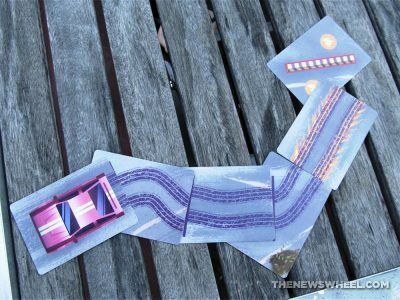 To advance across the track, players have the option of drawing a variable amount of movement cards and placing them in front of the vehicle card to advance its path. Once cards are placed and the car moves up, cards are returned to the grid. If players’ cars intersect with other vehicles or barriers, their turn ends. If the car gets close enough to an obstacle to only touch the boost icon, they get to move a little extra. Players can reverse their cars to avoid tricky situations, though it does slow their advancement. The player also has the option once per game to draw all six movement cards in a “nitro” boost. Its available Ramped Up expansion adds six more cards: a barrier, a truck for a fifth player, two oil slicks, and two ramps. Instead of a tuck box, Turbo Drift comes in a plastic sleeve for carrying in one’s pocket rather than displaying on a shelf. It’s the size of a wallet and durably constructed with a concrete-like aesthetic. The cards are durable enough for the game and won’t crease without force, though this would be a good game to sleeve based on repeated wear and use (I’d recommend using coarse-backed sleeves to keep the cards from sliding on the table). The wallet is thick enough to still store the base and expansion cards if all sleeved. 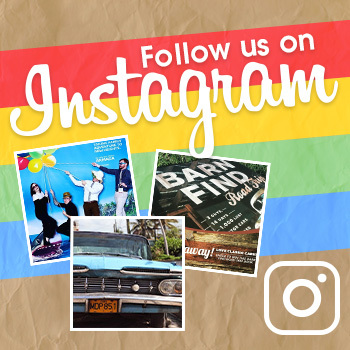 The cards have a gritty yet colorful retro style, with purple tire tracks and neon colored cars against the asphalt backgrounds. The nostalgic throw-back aesthetic gives the game visual character, though I’d say it’s more mid-1980s in style and car design than late-1970s as it claims. 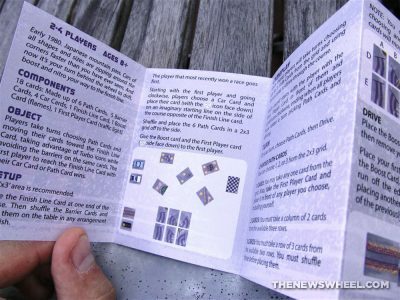 Turbo Drift is a relatively simple game to understand (though not necessarily to master), so its rule book is unsurprisingly short: a folded, card-sized pamphlet. It’s well-organized into sections and includes multiple visual examples, though, so you can read and teach it right before your first play, making it a nice item to take and teach on the go. The only aspect that didn’t receive enough explanation was reversing a vehicle, which had some confusing wording and led to some debate among players. The Ramped Up expansion adds its own instructions card with brief explanations of the new barriers. I’m not a fan of micro games (you receive a limited amount of goods for the price), but I can see why Turbo Drift works with a “less is more” approach. Drift racing is a highly technical yet shapeless style of driving that’s challenging to capture in a widely accessible card or board game. Cramer’s approach of using the open space between cards as the track instead of defining every movement on a gridded board overcomes this obstacle. There are no secret hands of cards hidden from players or randomness in what will happen during the game. Winning is all planning, vision, and forethought—skills that are appropriate for a racing-themed challenge. However, for as much as Turbo Drift offers in unique gameplay and set-up, it felt like less than the sum of its parts as an experience. The first handful of turns clip along smoothly, but often eventually devolve into tedious repeated turns where you’re reversing and running into obstacles if you try to play it anywhere above a beginner’s level. At a beginner’s level, though, it’s easy to master. It’s not one of the strongest automotive racing games I’ve played, but it does commendably offer something unique to the field. The Ramped Up expansion is highly recommended to obtain as it adds an element of dexterity that enhances gameplay variance. 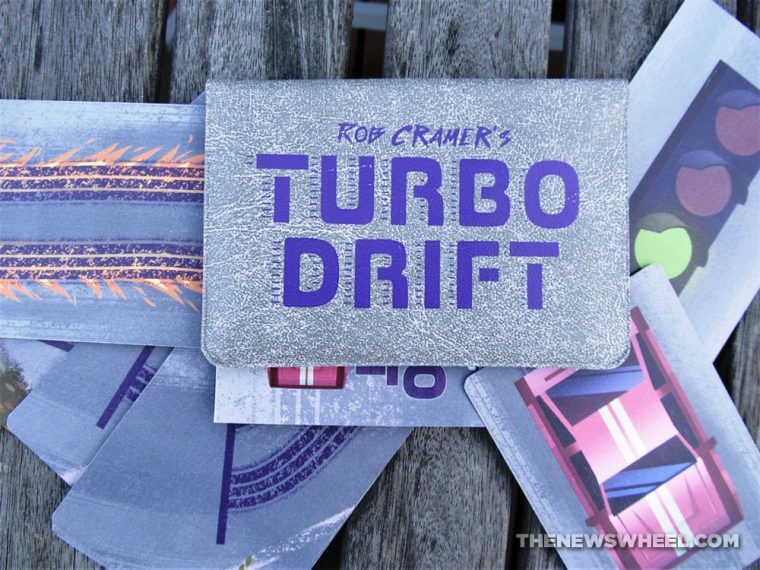 Rob Cramer’s Turbo Drift can be purchased through the publisher’s website.